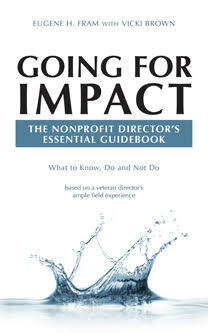 My experience shows that well functioning nonprofit boards establish and monitor the organization’s policies. The board operates through the president/CEO. In turn, the CEO executes policy and is responsible for the prudent and creative operations of the organization. In this role, the CEO exercises leadership resulting in the effective and efficient use of board and of other volunteer time. Although defining what are policy issues and what are operation issues is not always clear, for both for-profit and nonprofit organizations, following is a useful set of guidelines which attempts to make the separation for nonprofits by listing the board’s responsibilities. •	Determines whether policies are being carried out and goals and impacts achieved. Withe management, agrees on approaches for assessing qualitative objectives and impacts. Although in decision-making, both boards and CEOs will overstep these guidelines from time to time, persons of good will should be able to resolve the issues and articulate the differences between policy development and operations more clearly. The grey areas between strategy and delivery are often why difficulties arise. The one area that many organisations are not clear about is delegated responsibility. We must remember the policies and legal responsibility belong to the board and they are there to ensure the success of the organisation. Have the board got the right policies and procedures, have they delegated responsibility to the CEO, have they put the right controls and checks in place and are they carrying out their monitoring and evaluation role effectively. Again this is the ideal world and some smaller NFP organisations need to rely on their NED’s to get involved in delivery because they do not have the capacity to do this without them. As organisations grow there can be real tensions as the Board is asked to step away from the detail and take a more strategic role. Boards need to ensure they are in the right place, but, many find this difficult to do without outside guidance.